I guess it's hard to give this a star rating as it's my first scope and I have no previous experience to compare it to. So I will review this based on y expectations and what you get for the money. 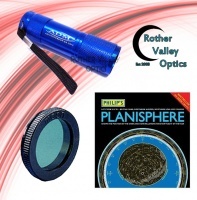 As my main initial interest is in the moon and planets rather than deep space objects I decided that a refractor was the one for me and chose Rother Valley Optics after a recommendation by my cousin. As it was a present I can't comment on the customer service, however it arrived quickly (a day earlier than expected I think so worth checking when it's getting dispatched). The plastic eyepiece protector had a small crack when I opened the box where it looks like the courier may have dropped it, however a quick look down the tube with an eyepiece showed the optics were not affected so this seems like a pretty robust scope. You also get a lot for your money! Scope, finder scope, mount, slow-mo controls, tripod, two eye pieces and a Barlow lens. You really don't need to think about buying anything extra to get going when buying this scope. Maybe a solar filter if you want to look at the sun. Everything seems good quality, although I am sure there are slightly more sturdy and refined tripods and mounts out there everything that came with this was as good, if not better than what I would expect for the price. It took me about half an hour to put it all together using the instruction manual which was ok (I'm a 32 year old adult and would recommend that an adult put this together and set up for observing as I think it would be too difficult for a child). I found it much easier to use a video off the internet to set up the scope outside for my first viewing and having got pretty close to a polar alignment I was able to start observing a few things before the weather set in. I found Jupiter almost straight away and couldn't help but smile upon clearly seeing the round disc of the planet in the eyepiece with it's distinct cloud belts and it's 4 visible moons in orbit (which are tiny white dots in the eyepiece). It is small in the eyepiece but clearly visible. Then I moved on to the moon. This was incredible, like looking at a 4k television showing a National Geographic documentary, but better! Using the 10mm with the x2 Barlow is still fantastically clear, being able to see the rough, imperfect edges of the dusty crater rims. I found this combination of eye pieces a bit too much for looking at Jupiter as it did start to loose detail, my favourite for this being the 25mm with the Barlow. Overall I was really pleased by what I saw during my first hour of observing. So if you want a good first scope I would say get this one, I may upgrade in time or buy a large Newtonian if I acquire a taste for searching distant stars, but for now I am very happy with what I have. 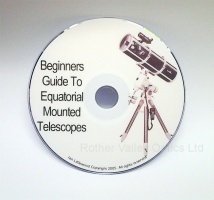 So read the guide in the link and buy this scope if you're interested. Just make sure you have somewhere suitable to store it, it is rather heavy and cumbersome to move around once the tripod legs are set up. Buy this scope and enjoy!